DHS’s Immigration and Customs Enforcement agency has increased investigations of employers suspected of hiring unauthorized workers. 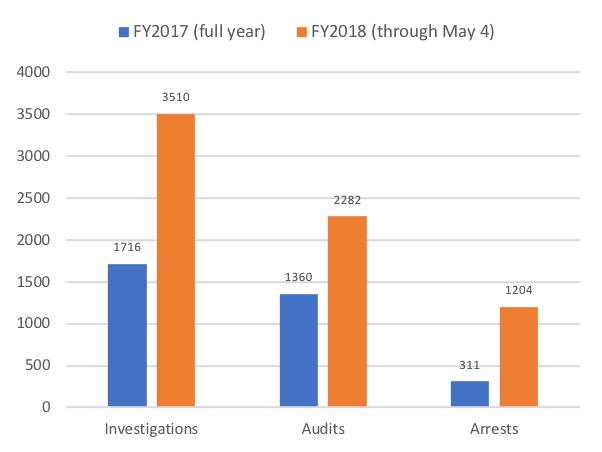 ICE’s Homeland Security Investigations division opened over 3,500 workplace investigations in the first seven months of FY18, and plans to open 5,500 investigations before FY18 ends September 30, 2018. After ICE audits, employers receive Notices of Suspect Documents that inform them which workers appear to be unauthorized. Employers must "take action" on suspect employees within 10 days, firing them if they do not clear up discrepancies flagged by ICE. Most workers quit when informed of discrepancies between the documents they presented to employers when hired and the information in government databases. However, HSI agents can and do arrest workers suspected of being unauthorized in the US, an average of 170 a month in the first half of FY18. ICE audits are relatively non-controversial, since they target employers and usually circulate rather than remove unauthorized workers from the US. In the late 1990s, Operation Vanguard became controversial in midwestern meatpacking plants after the then-INS obtained I-9 forms from employers, checked them against government databases, and visited plants to interview suspected unauthorized workers. In 1998-99, INS found that 4,500 or 17 percent of the 26,470 employees in 66 meatpacking plants in Nebraska had provided suspect documents. When informed of discrepancies, 80 percent of these workers quit; only 35 of the almost 1,000 workers who were interviewed by INS agents were arrested. Operation Vanguard drew widespread criticism. Employers and unions representing workers said that that worker turnover disrupted production in a state with very low unemployment, while NGOs and churches complained that unauthorized parents could no longer support their US citizen children. Those who wanted INS to crack down on unauthorized migration complained that the unauthorized workers simply went to other jobs rather than being removed. Vanguard was halted in 2000. ICE workplace inspections that include worker arrests draw media attention. ICE raided meatpacker Southeastern Provision in Bean Station, TN on April 5, 2018 and arrested 97 unauthorized workers. Southeastern paid workers $10 an hour or more and was not particular about work-authorization documents. Low rents meant that homes for eight could be had for $700 a month, drawing migrants to the area. Hamblen county, where Southeastern is located, attracted Mexican migrants for tomato picking jobs. Many settled and sought year-round meatpacking jobs. In 2018, Latinos are 11 percent of county residents and a quarter of K-12 students.